This game is a funny cartoon graphic-adventure of classic style. The player slips into the role of HalMock FurBall, an intelligent extraterrestrial hamster, who is about 4ft tall. During his adventurous journey across the universe, he gets off course and crashes on earth. He does not get injured, but his ship is badly damaged and stuck in a crater. In the demo, the player explores the town and looks for a way to pull his ship out of the crater. Along the way, he meets many weird characters and is confronted with tricky tasks to be fulfilled. 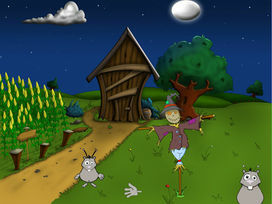 The game uses custom developed EerieEngine v0.4, and is a fully playable adventure game with funny characters, great looking cartoon graphics and tricky puzzles. The game was created from first idea to playable demo state in merely two and a half weeks and earned the best mark as a study project.